Had a leisurely dim sum lunch with my friend at the much acclaimed Royal China, with branches spanning London, Singapore and Shanghai. 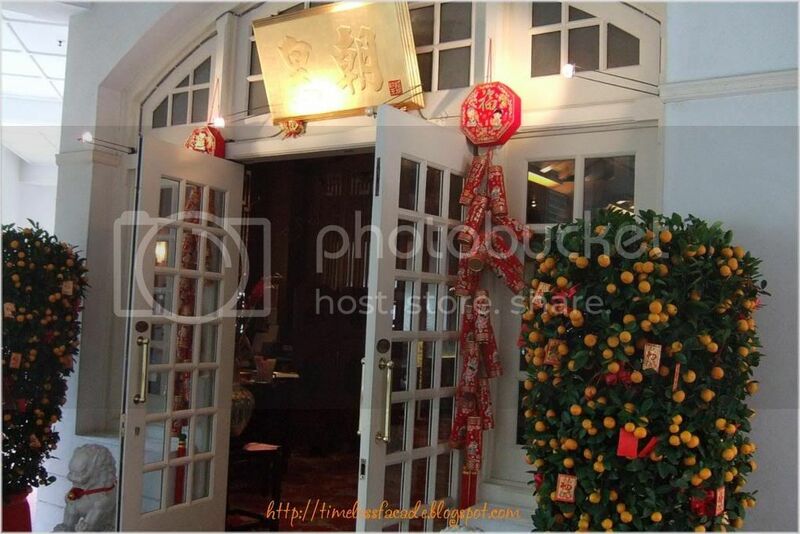 The Singapore branch is aptly located at one of Singapore's top and most historic hotel - Raffles Hotel. 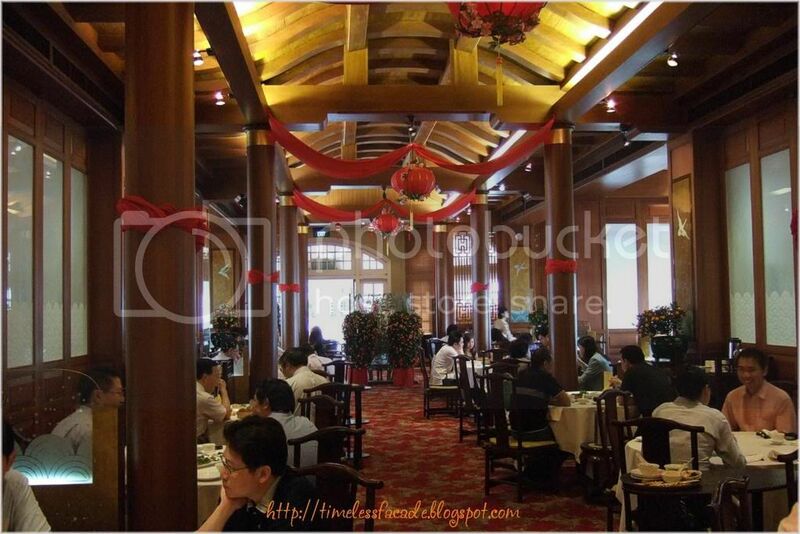 Reservations are a must at this restaurant as it is relatively small (probably about 15-20 tables) and is thronged by many executives especially during the lunch period. My friend and I learnt it the hard way and had to wait 30 minutes for a table. But then again, we got lucky as we were ushered into a private room due to the lack of available tables. Decor at this restaurant revolves around wood, attempting to recreate a layout that shouts ancient imperial Chinese. Wooden beams and arched high ceilings complete with stained glass give the whole place a nice soothing feel. This is the first time I've actually tried this dish and I must say that I'm pretty impressed with it. The skin is thin, soft and tangy, yet strong enough to encapsule the delicious egg white and dried scallop. The entire dish came across as very smooth and light. A must try! 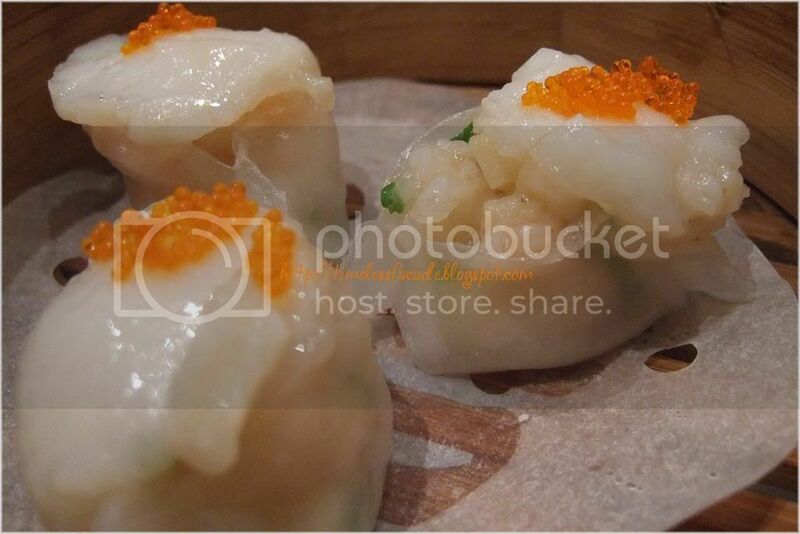 A must have for every dim sum session, the prawn dumpling or Har Gao was excellent with fresh and succulent prawns wrapped in a slightly chewy yet thin skin. How misleading names can get. 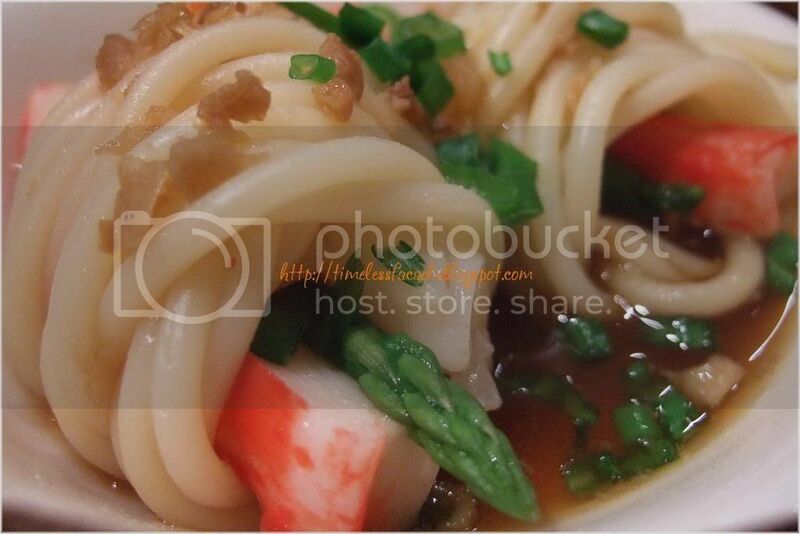 I certainly didn't expect the steamed seafood roll to come looking like noodles. But I'm certainly not complaining. The noodles were springy and shrouded a piece of scallop, asparagus and prawn. When eaten together with the light sauce, the lingering taste of the ocean meets with the earthly taste of the asparagus to exude a myriad of wonderful flavours. 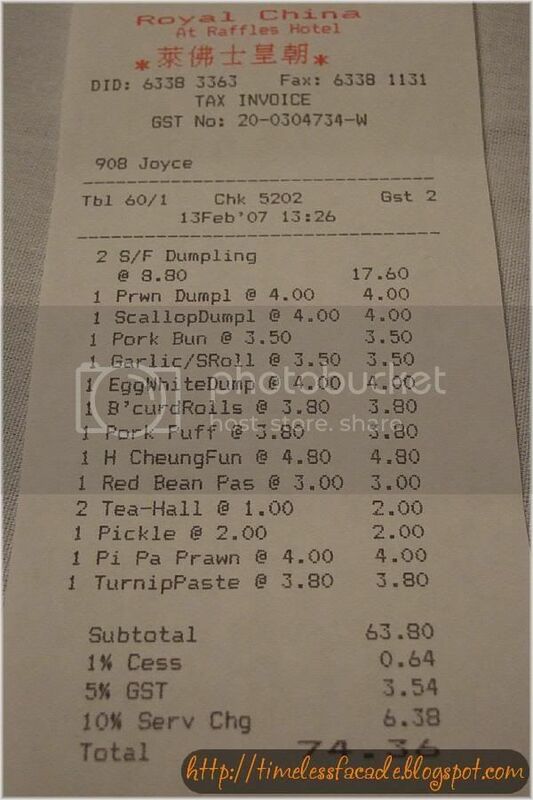 This was no more than a serving of Char Siew Cheung Fan, Prawn Cheung Fan and Scallop Cheung Fan. 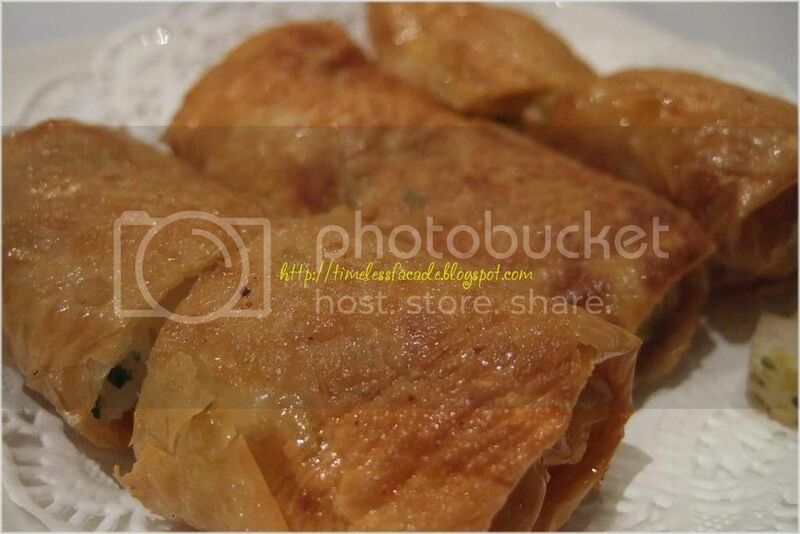 However, the Cheung Fan in itself is commendable, with its soft and silky texture that guarantees to slither down your throat with great ease. Fillings are fresh as well of course. One of the very few normal tasting dishes that we ordered. 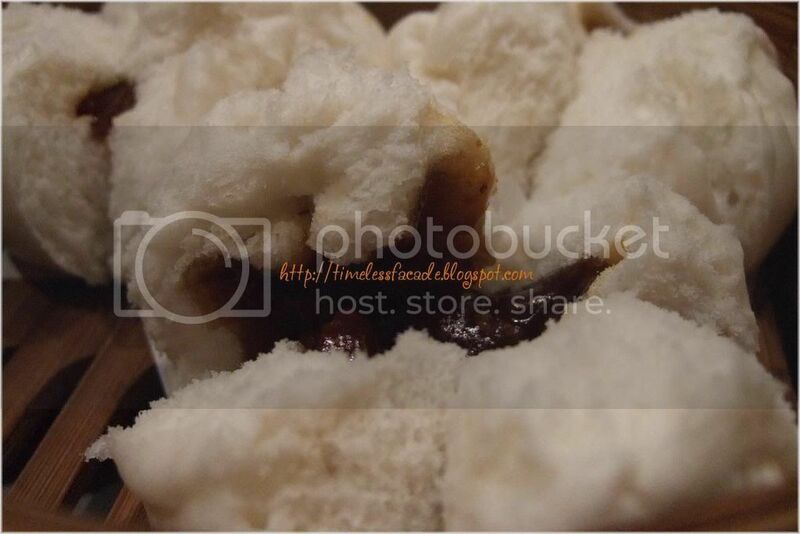 It was definitely better than your average pau, but certainly not in the leagues of D'Bun or Teochew Handmade Pau. This dish didn't bowl me over, but was of a certain standard. 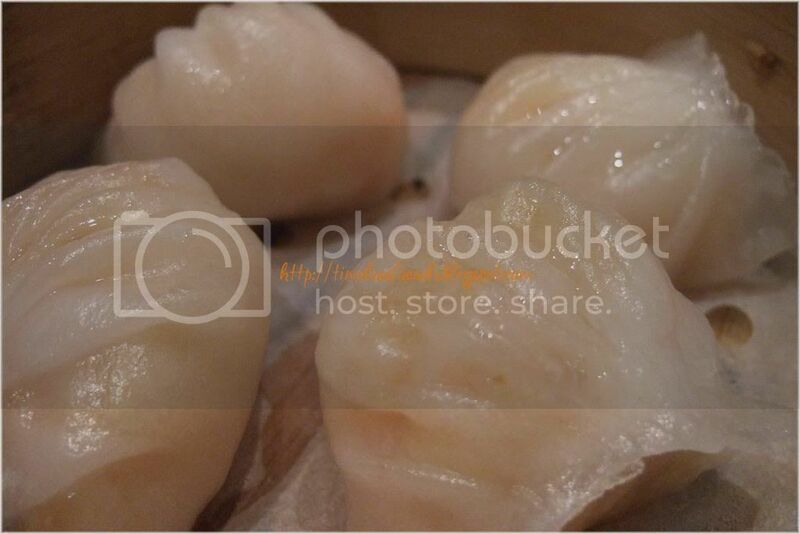 The scallops were fresh and the dumpling skin was nicely done. It just lacked the wow factor. 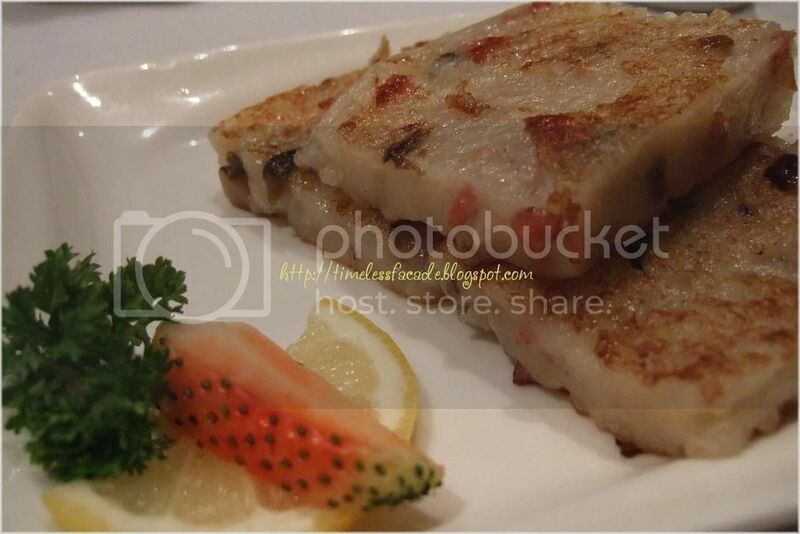 Undoubtedly one of the star attractions of the dim sum at Royal China. 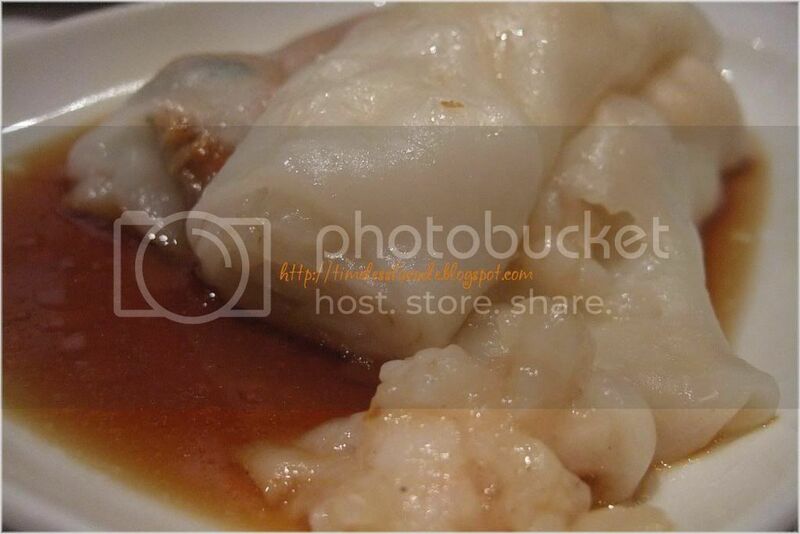 The dumpling skin was soft and smooth, with the shark's fin relatively decent. 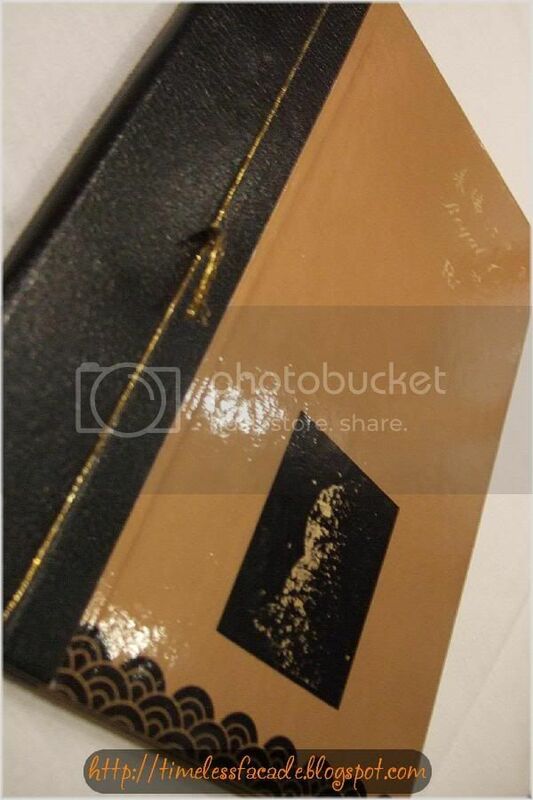 Please note that its only $8.80, so do not expect top grade shark's fin or even something close. 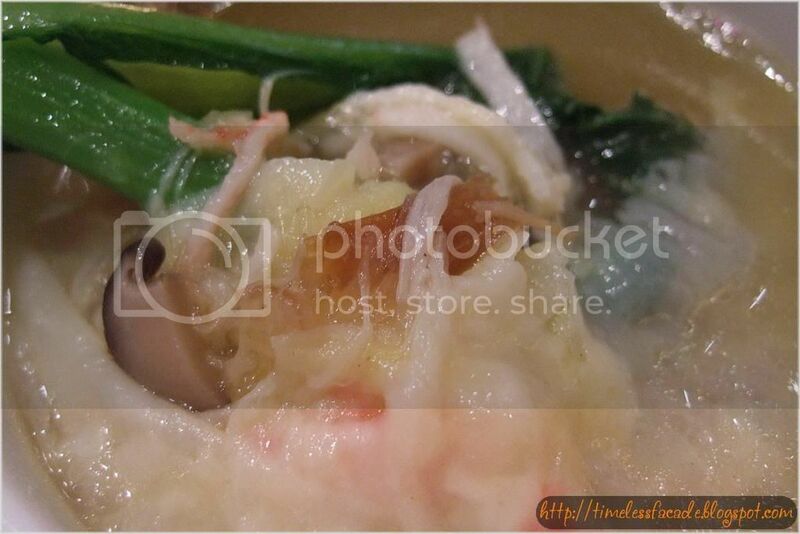 The soup was tasty yet not too heavy on the flavours, making it light on the palate. Another of my all time favourite dish. 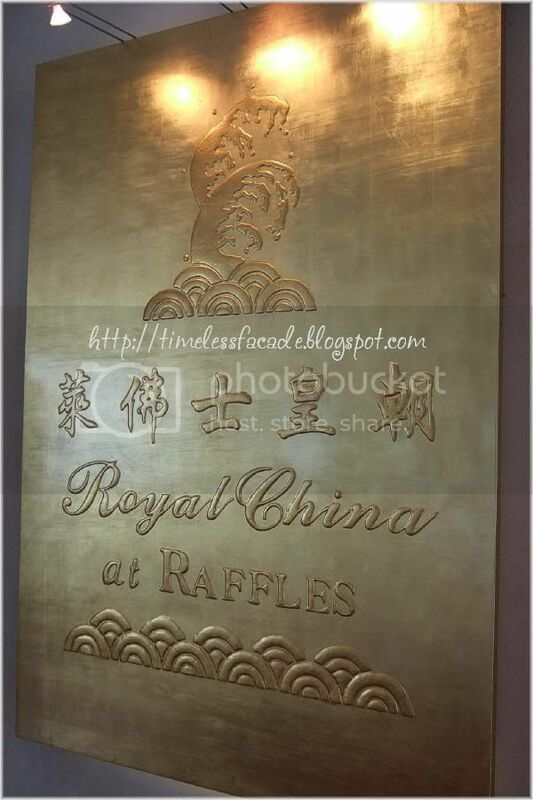 I couldn't help but compare Royal China's version to that of Wah Lok and I'm glad to say that both are equally good. 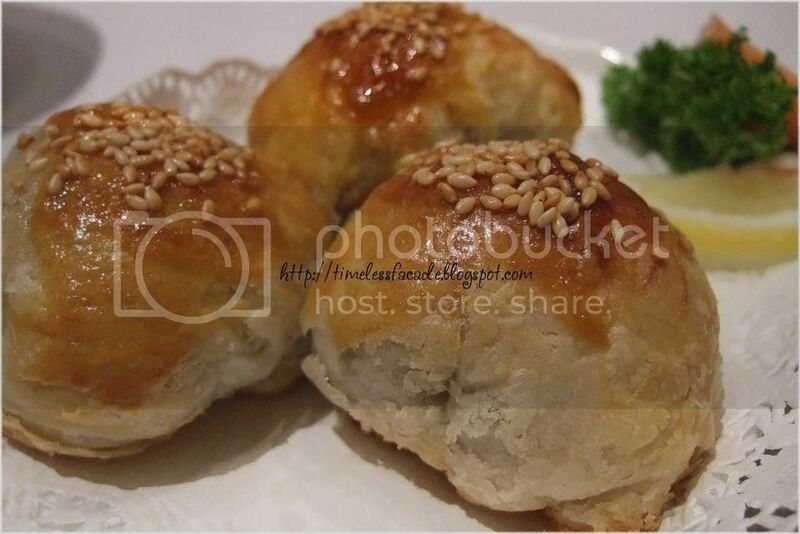 The beancurd roll is deep fried to a crackling crisp and then dipped into quality soya sauce for maximum enjoyment. Ah. 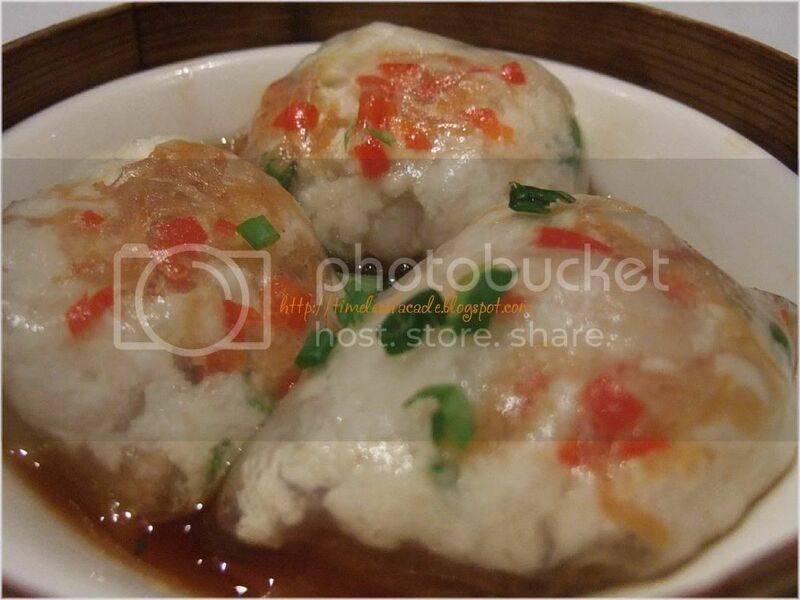 One of my favourite dim sum dishes. Royal China's rendition was quite good, but certainly not the best that I've tried. The crust was nicely baked with the sesame seeds putting on a strong showing. However, it lacked the baked taste that I like. The Char Siew filling, though rather tasty, was a teeny weeny bit too sticky. 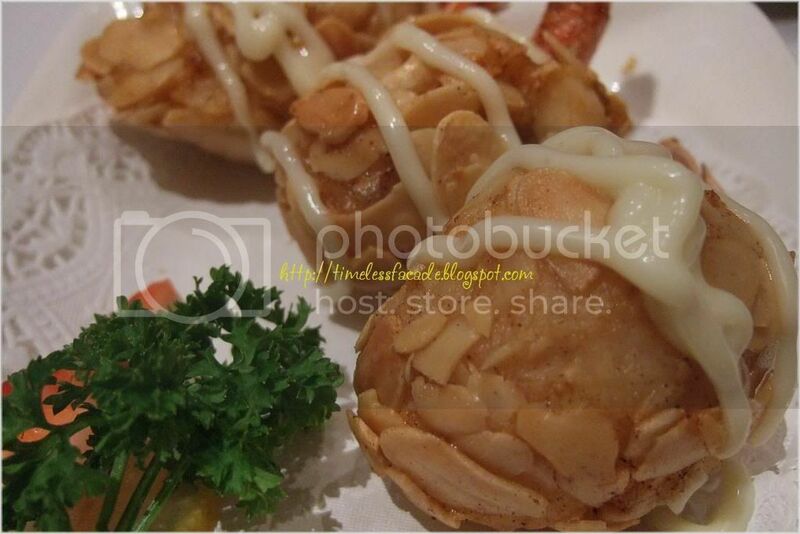 Big, fresh and succulent prawns covered with lots of almond flakes. That's just about as exciting as it gets. Nothing special, but still a very decent and quality dish to try if you like almond with your prawns. East meets west in this dish and it turned out less than expected. 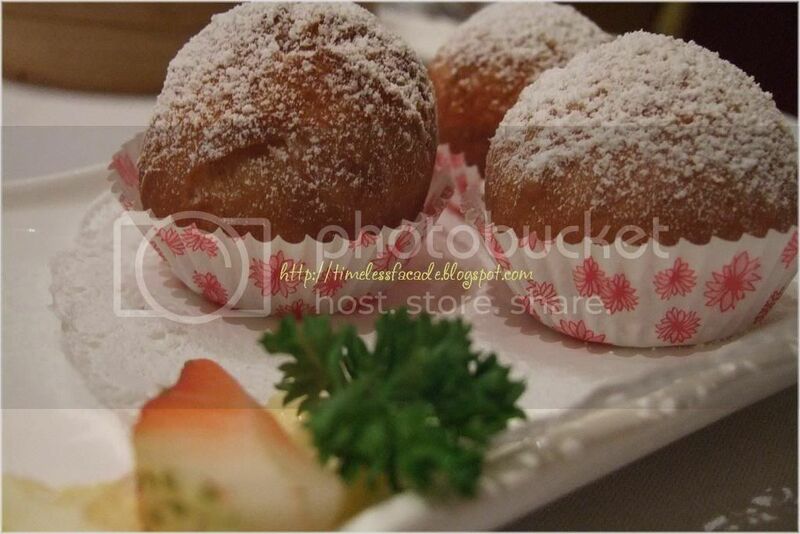 I personally found the red bean paste too dry and hard and the donut a little too oily. A hot flowing red bean paste might have saved the dish. Marginally perhaps. The old adage speaks true. Appearances can be deceiving. This was the case with the carrot cake. When it was served, we were dismayed as it looked rather unrefined and gave us the impression that it was hard like those you get in the hawker centres. To our amazement, it was smooth and soft without weighing in too heavy on our tastebuds. Having said that, I still reckon that Wah Lok serves a meaner rendition of this dish. An inspiring (at least for my friend) lunch for 2 pax cost about $75, which in my opinion is money well spent. The quality of dim sum is top notch and the ambience is great. 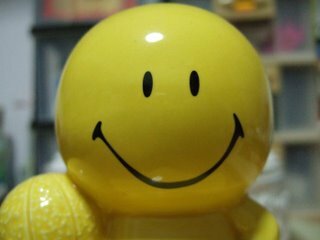 Service is good but a small minority of the staff could show more patience. If given a choice between this or Wah Lok, I'll choose this over the latter simply because it has a much wider selection of dim sum items. I'll definitely be back, with reservations of course. Thanks for the recommendation! i have been looking for great dim sum for a while and I tried this place yesterday. I loved all of it! Keep up the mouth-watering postings!